seriously tho. whyd chatbox disappear? Just saw 2.0 was supposedly released today... you upgrading, kryme? DevStarr wrote: Just saw 2.0 was supposedly released today... you upgrading, kryme? Yeah. Its in test mode right now, but the full version will be up later, so I'm just waiting on that. I'm aware but I'm having all kinds of issues and I have zero idea how to fix them. hm.. ok well the only thing I could figure out was it was the forum version giving causing the issues. But everything seems to be working now. Fixed problem by clearing cookies. It was working yesterday, and im pretty sure it was working earlier today too. It went away for me when i logged off and logged back on. Wonder if that has something to do with it. 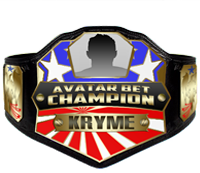 KRYME, YOU GOTTA FIX THE CHAT FOR THE FIGHTS TONIGHT BROTHER!! chat has been working all day for me no problems.